ISAMELT technology is a relatively new commercially available approach which launched in 2009 and is based on furnace design which was derived and developed from the first ever demonstration level furnace in 1983 in Australia. Advantages include lower emissions, highly efficient mixing through lance injection, and small plant footprint through vertical process approach. ISASMELT TSL technology is well established for both primary and secondary copper and lead smelting. ISASMELT™ technology is based on a furnace design which is readily enclosed to eliminate emissions to the surrounding environment. It uses submerged lance injection technology to provide highly efficient mixing and reaction of feed materials in a molten slag bath. The use of advanced process control systems results in the furnace operation being largely automated. Being a vertical furnace, a very small footprint of floor space is required to accommodate the plant and so it can generally be easily retro-fitted into existing smelters to either augment or replace existing technology. The process concept is shown in Figure 1. As mentioned above, the development of the process has centered around the smelting of lead and copper concentrates or secondaries on a commercial scale. The first demonstration-scale lead furnace was commissioned in Mount Isa, Australia, in 1983 to treat lead concentrates. It was followed in 1987 with a demonstration-scale copper plant, which in turn was followed by construction of a full-scale copper plant in 1992. This 3.7-metre diameter furnace smelts all copper concentrate treated in the Mount Isa copper smelter. During almost 25 years of developing and operating submerged lance technology on large-scale plants, significant technical improvements have occurred in areas such as furnace design, feed preparation systems, offgas handling, operating and process control strategies, refractory management, and operator training. The combined experience led to what is now known as the ISASMELT™ technology package, which is licensed to external clients. By 2009, commercial ISASMELT™ furnaces operated by Xstrata and external licensees will have a combined annual smelting capacity of more than seven million tons of concentrates or secondary raw materials. Many of the improvements implemented by plant operators have been passed on to, and adopted by, other licensees. Exchange of ideas and technical improvements occur through ad hoc visits to fellow licensee sites and through regular licensee workshops arranged by Xstrata Technology. In the Isasmelt process for copper smelting, copper ores are reacted with oxygen and silica to form a two phase liquid mixture of copper matte and slag in the Isasmelt furnace. This mixture is then settled in a rotary holding furnace (RHF) where the mixture is fed in at one end and exits through side ports close to the opposite end of the furnace. The shape of the RHF is a long circular cylinder lying on its side and sits on a set of rollers. The rollers enable the RHF to partially rotate about its axial axis to alloy the copper matte and slag to be poured out through exit ports that are located at opposite ends of the circumference. 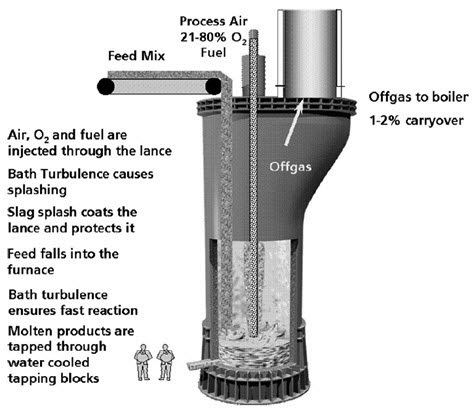 The high temperatures and corrosive nature of the mixture does not allow the feed to be fed at the interface of the two fluids as it is poured into the RHF through a chute onto the surface of the molten fluid and then allowed to separate out with the contents tapped at convenient intervals depending on the downstream processes. Matte is often entrained in the slag layer and results in the loss of copper when the slag is disposed. The Isasmelt process for lead is a fully continuous two-stage process based on gas injection into melts via a top entry submerged Sirosmelt lance. Submerged injection produces turbulent baths in which high-intensity smelting or reduction reactions may occur. In the first stage of the process, lead concentrate is added directly to a molten slag bath, and is oxydised by air injected down the lance. Simultaneously, the high-lead slag from this furnace is continuously transferred down a launder to a second furnace and reduced with coal. The crude lead product and discard slag are tapped continuously from the reduction furnace through a single taphole and separated in a conventional forehearth.